We’d love your help. Let us know what’s wrong with this preview of The True Heart by Helena Halme. London 1990. When Kaisa suffers a third miscarriage, her submarine officer husband Peter is devastated. Kaisa, who has chosen a job with the BBC over the traditional life of a Navy wife on a marriage patch in Scotland, feels guilty. Has living apart from her husband to pursue a demanding career, contributed to her inability to keep hold of a baby? Read this new dramatic European love story today! To ask other readers questions about The True Heart, please sign up. The Young Heart - My first book by this author and I have conflicting thoughts after reading all five books sequentially. I usually chain read as many books by one author as possible, but I had to pick up other books to take a break from Kaisa. This is introduction to Kaisa the main character and several supporting characters of the Nordic Series. Kaisa is a 14-year-old female. Her thought processes, or lack of, her experiences with her family members and her friends-to-lovers relationship with The Young Heart - My first book by this author and I have conflicting thoughts after reading all five books sequentially. I usually chain read as many books by one author as possible, but I had to pick up other books to take a break from Kaisa. This is introduction to Kaisa the main character and several supporting characters of the Nordic Series. Kaisa is a 14-year-old female. Her thought processes, or lack of, her experiences with her family members and her friends-to-lovers relationship with a 21-year-old man. I was fortunate to read this book before I read the other four books in the series and found the foundation set in this story explained some of her decisions she made in the other books. But it is not a must read to understand the other books. The English Heart #1 (aka The Englishman) - Well edited and easily read with a simplistic, choppy writing style, and interesting descriptions of Sweden and Finland and some good main and supporting characters. There's a lot of music references that don't do anything for the story but give a timeline, if you know when the music first played. The movies help explain some of her mindset. Terribly moving love story and I am so glad to have found this author when I nabbed a copy of the first story in this series (The Finnish Girl)! The prose is well-written, clear and simple, conveying a complicated life for Finnish-born Kaisa and her British Naval officer husband Peter. She builds such a full world for them, with lots of family, friends, work colleagues, and past acquaintances that shaped their lives. This couple's relationship suffered through separation, loneliness and infideli Terribly moving love story and I am so glad to have found this author when I nabbed a copy of the first story in this series (The Finnish Girl)! The prose is well-written, clear and simple, conveying a complicated life for Finnish-born Kaisa and her British Naval officer husband Peter. She builds such a full world for them, with lots of family, friends, work colleagues, and past acquaintances that shaped their lives. This couple's relationship suffered through separation, loneliness and infidelity and yet still survived. The plot really gained momentum as it moved along and supplied some major twists and heart-stopping surprises along the way. (No Spoilers!!). 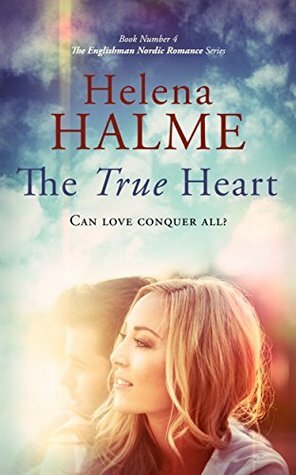 The True Heart by Helena Halme is book 4 of The Nordic Heart Romance Series. This story will keep your interest. It has plenty of plot twists, . It deals with infidelity, living separately, an old flame, illness just for some of the drama. The end is a big twist that I did not see coming.Helena Halme writes with emotion,frustrating and most of all believable. I received a copy thru a Goodreads Giveaway. I voluntarily reviewed an Advance Reader Copy of this book . Wow what an emotional roller coaster. This moving story is about Kaisa who works for BBC and her husband Peter is a British Naval officer. Kaisha suffered her third miscarriage and her husband was devastated. She felt guilty thinking that her over demanding job contributed to her miscarriage. Lots of twists, infidelity, living separately, an old flame, illness and more drama than you can imagine. A good read that you will enjoy. Wow! I’ve read all 4 books in this series. I just couldn’t put them down. Beautifully written with a deep insight into realistic relationships. Emotional, frustrating and believable. Thank you Helena. As enjoyable as ever - with a big twist in the end! Didn't see that coming! I managed to get a third of the book read. But nothing was happening of any interest. Could this book move slower? I give up. Absolutely loved the book. What a great love story!!! Highly recommend. I won this from Goodreads, I was not required to give a favorable review. This is a wonderful book about love & forgiveness and overcoming things. Helena Halme is a Prize-winning Finnish author based in London. Her books include The English Heart, a best-selling romantic novel, which won an Awesome Indies badge on publication. Her other titles include The Faithful Heart, The Good Heart, The True Heart and The Young Heart in the Nordic Heart Series and Nordic family drama, Coffee and Vodka. Helena has also written a Cold War spy thriller, The Helena Halme is a Prize-winning Finnish author based in London. Her books include The English Heart, a best-selling romantic novel, which won an Awesome Indies badge on publication. Her other titles include The Faithful Heart, The Good Heart, The True Heart and The Young Heart in the Nordic Heart Series and Nordic family drama, Coffee and Vodka. Helena has also written a Cold War spy thriller, The Red King of Helsinki. Helena is the winner of the John Nurminen prize for best thesis on British politics, a former BBC journalist, and has also worked as a magazine editor and a bookseller and, until recently, ran a Finnish/British cultural association in London. Her articles have been published in the CoScan Magazine, The ScanMag and the Finn-Guild Magazine.